Review your cleansing ritual - This is a critical first step to any deeply beneficial routine, so try our Hydrating Renewing Rose Cleanser for a rich but gentle cleanse, Jojoba essential oil naturally breaks down stubborn make-up, whilst precious Damask Rose keeps the skin looking healthy and radiant and the balancing properties of Geranium keeps your skin hydrated and bright. Add in a Face Oil – Oils are one of the most natural and effective ways to hydrate your skin as they are recognised by your skin and replace essential fatty acids and anti-oxidants without clogging pores. 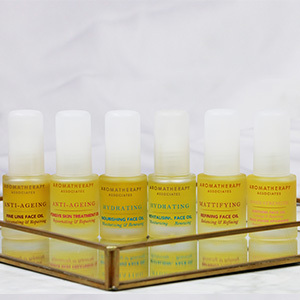 Try one of our six Face Oils and discover the natural benefits on your skin. Anti-Ageing Fine Line Face Oil - A super-rich Face Oil that reduces the appearance of fine lines, giving your skin a deep treatment. Essential oils of Rose and Patchouli encourage healthy glowing skin whilst Apple and Raspberry seed oils help to plump your skin's appearance, softening the look of fine lines. Anti -Ageing Intensive Treatment Oil - Includes a unique blend of vitamin-rich essential oils to help soothe dry, dehydrated skin and prevent fine lines and wrinkles. Lavender and Vitamin E are renowned for supporting stressed skin, while Rose and Rosehip seed oils optimise skin vitality to support natural skin renewal. Hydrating Revitalising Face Oil - This blend of Frankincense and Rose Oil helps to rejuvenate and smooths the skin leaving it appearing radiant and glowing throughout the year. Hydrating Nourishing Face Oil - Nourishes dehydrated skin with its blend of Evening Primrose oil which replenishes and helps to soften and smooth dry skin, while Rose oil stimulates circulation, keeping the complexion to appear youthful and radiant. Mattifying Refining Face Oil - This light daily Face Oil includes the renowned properties of Lavender and Ylang Ylang to leave the skin feeling and feeling comfortable and conditioned. Inner Strength Soothing Face Oil - Intensely hydrates and restores moisture to the skin, this Face Oil includes plant based prebiotics to help strengthen the skin's natural protective barrier and Arnica which helps calm and minmise skin redness leaving your complexion feeling and looking healthy. Layer in a Serum – An additional step that could be added is a botanically charged serum. Serums are lighter and formulated with smaller molecules that penetrate the skin quickly and deeply. Hydrating Rose Radiance Skin Serum - Gives an instant boost for tired, dull skin. Evening Primrose Oil reduces dryness, irritation and flakiness, and Geranium and Rose Water boost your circulation for an instant skin wake-up. Inner Strength Soothing Serum - Formulated for sensitive skin, this intensely hydrating and soothing face serum cools and restores moisture to the skin leaving it feeling and looking radiant all year round. Refresh your skincare routine, try something new and see for yourself how it can rescue your skin this season!